Doesn’t the order of fossils in rock layers demonstrate evolution from simple to complex organisms? With invertebrates the data are ambiguous; the best case for increasing complexity can be made with vertebrate fossils and plants. However, there are other valid interpretations more consistent with the Biblical record and patterns of fossil appearance. First let’s review the data; rare microscopic organisms are found in the lowest rock layers, called Precambrian. Fish, amphibians, and coal forming plants dominate in the Paleozoic layers just above. Higher up one finds reptiles, including dinosaurs, in the Mesozoic, while flowering plants and mammals are relatively abundant in the top Cenozoic layers. While some types of fossils, like some filamentous algae and brachiopods, are found throughout the layers, the seeming increase in complexity of vertebrate animal fossils, as one ascends in successively higher rock layers, is considered by many scientists as very strong evidence for evolutionary advancement over billions of years. This view is in sharp contrast with the biblical account of God creating the various forms of life in six days (Genesis 1 and 2; Exodus 20:8-11, 31:16-18) a few thousand years ago, followed by the Genesis Flood (Genesis 6-8). The Flood may account for much of the fossil record as well or better than evolution over billions of years. There are serious problems for the evolutionary model, such as the absence of fossil intermediates between the major animal and plant groups, but the increase in complexity of vertebrates and plants as one ascends the fossil record challenges the Flood as an explanation. How can one reconcile increasing complexity with the biblical account of beginnings? Many years ago, Edwin Cope suggested a trend towards evolution creating increasingly larger organisms. Some creationists have suggested that this general increase in size within the fossil record might be due to a greater motility of larger organisms during the Genesis flood which helped them escape to higher locations before being buried in higher layers of mud that turned to rock preserving them as fossils. Flotation factors may also facilitate sorting of some animals and plants. A particularly intriguing theory suggests that the sequence of the fossils reflects the distribution of organisms before the Flood. In this Ecological Zonation Theory (EZT), the first organisms buried by the Flood lived at the lowest levels, and as the Floodwaters gradually rose, organisms living at higher and higher regions were gradually buried. 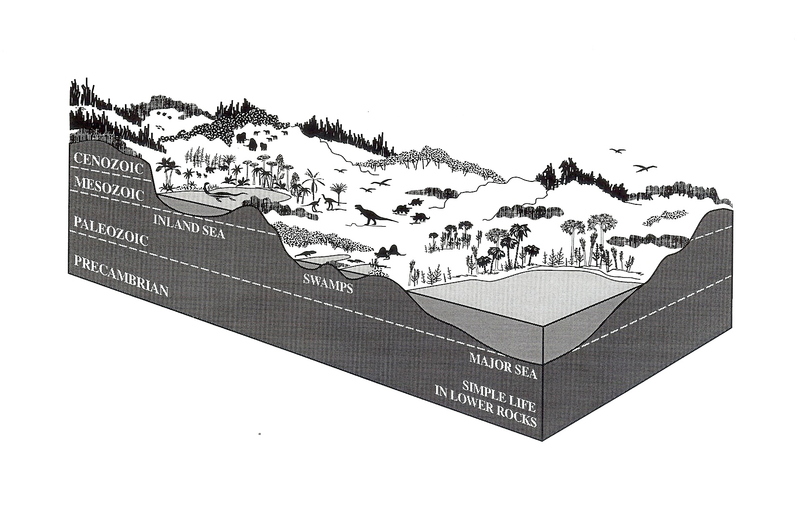 Hence, the fossil sequence reflects the altitudinal distribution of organisms in the world before the Flood (see fig. 1). Figure 1. A suggestion of the general distribution of organisms before the Genesis Flood. EZT proposes that the gradual destruction of these environments by the rising waters of the Flood would produce the sequence of fossils as found in earth’s crust. The EZT model does not propose a distribution of organisms on the earth that is identical to the present. Implicitly, it must accommodate the much greater variety of basic kinds of organisms found in the fossil record relative to those now living. Dinosaurs are an example and according to EZT they lived in the mid-altitudinal levels (Mesozoic). Also, marine fossil distribution suggests more seas at different levels than at present. Mammals and flowering plants dominated in the upper levels, possibly kept there by competition from other kinds of organisms at lower levels or by climatic factors. It needs to be kept in perspective that in a complicated worldwide Flood one would expect that several other factors besides EZT would affect the deposition order of organisms, but EZT provides a framework consistent with the generally observed fossil sequence. In the EZT, the fossil microorganisms of the deep layers (Precambrian) do not represent the first forms of evolving life as evolutionists propose; they are simply the tiny microorganisms that normally live in deep rocks which later became fossilized. The sudden appearance, without evolutionary intermediates, of the major marine animal phyla in the lower Paleozoic (Cambrian Explosion) represent fauna of the lowest seas before the flood, and the sudden appearance of land organisms higher up (Silurian) are from the lowest pre-Flood dry land. In the context of the EZT, as we consider fossil microorganisms in the deepest rocks, fossils of marine organisms higher up, and terrestrial organisms still higher, we have a real sequence of advancement as we go up through the fossils, but it is not due to millions of years of gradual evolution, it is what would be expected from the Genesis Flood. 1. Clark HW. 1946. The New Diluvialism. Angwin, California: Science Publications. 2. Roth AA. 1998. Origins: Linking Science and Scripture. Hagerstown, Maryland: Review and Herald Publishing Association, p 162-177. 3. www.sciencesandscriptures.com, see Discussion No. 11; video No. 8 in the WHERE IS TRUTH? series. If one accepts the evidence of the Cambrian Explosion at face value, the Darwinian theory of evolution is falsified. Unsurprisingly, evolutionists have tried to explain the Cambrian Explosion as an artifact, due to the incompleteness of the fossil record. However, there is an explanation for the Cambrian Explosion that is consistent with the data. An intelligent being could generate the genetic information needed for a diversity of body types in a short time.